New Composite Color Shines Like GOLD! 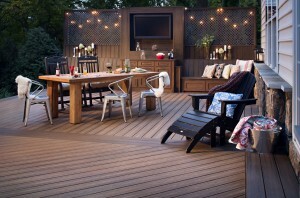 There are many reasons to use a high performance composite deck material to build your outdoor living space. Composite is made from 95% recycled materials, this saves 400 million pounds of plastic and wood scrap from landfills every year and has a 25 -year limited residential warranty, but now, you can add beautiful colors to why you should build with composite. It is easy being green when you are lounging on your composite deck. 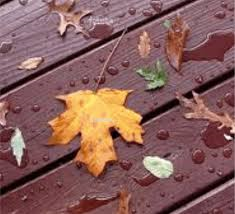 Another great reason to invest in a composite deck is that it provide you with low maintenance all year long. Now isn’t that a breath of fresh air! Trex has now launched its new beautiful Havana gold color to there popular Trex Transcend Tropical collection. Havana Gold gives a rich, golden look to the sleek composite material making your deck feel warm and elegant, and with a little help of your imagination, you can feel like your sitting in the tropics embracing the outdoors. Havana Gold, like the other 9 tropical colors, features a subtle shading and natural hardwood looking grain to give off a look of hardwood from the tropical rainforests without destroying the environment. Check out all the great Transcend colors that Trex has to offer. Lets take the work out of the weekend and spend more time admiring the beauty of your investment! Decks are more than just floors and stairs, building a deck means working from the ground up, starting with your footings. To make sure you have a safe deck, a sound foundation is crucial, this includes supports like your ‘footings’. Footings support the load of the deck so there is no sinking. Concrete pillars with footings resist frost upheave and in Nova Scotia, lets face it, they need to resist wind uplift as well. With proper footings, you can consider your deck to be anchored down, for all seasons! Footings use to be back-breaking work and could take days to complete, until the day arrived, when it was finally spotted, Bigfoot! The BigFoot, which proudly was developed in Nova Scotia, was designed in a tapered cone shape with sizing at the top to fit any size footing tube, commonly known as the SonoTube. With this new design there is no need for forms to be built, this minimizes workload and time when building a deck. In Nova Scotia it is required that the footing extends past the frost line, ensuring a firm foundation for your deck. The footing tube is placed into the hole allowing the concrete to be poured smoothly and forming a concrete column and footing at the same time. Now, most DIY decks use ready-made blocks or also know as, deck blocks as footings. These type of blocks rely on soil conditions and if the soil condition’s are bad, can cause sinking or with frost cause the deck to rise. They also have no hold down capacity against wind uplift, which is a weather element known for weakening decks in Nova Scotia. These type of footings can only be used on a deck that is less than 600mm off of the ground and is not attached to a dwelling or building. You should always contact your local building official for clarification of your deck design if it is not designed and built by a professional. Lets keep your deck safe, All-Craft believes in Big Foot! https://www.allcraft.ca/wp-content/uploads/2014/10/images.jpg 212 174 Laura https://www.allcraft.ca/wp-content/uploads/2017/04/AllCraft-Renovations-and-Deck-Building-Logo-2.png Laura2014-10-10 14:40:382018-02-20 15:23:53Deck Footings | Big Foot Is In N.S. If you have come to the conclusion that it is too late to build your dream outdoor living space, we have the reasons why you should change your mind! People seem to think you can only build decks and outdoor living areas in the Spring and Summer, but Fall brings many reasons to build your deck! Building a deck in the Fall leads to less of a negative impact on your landscape. During the Spring or Summer season the weather can range from hot, sweltering days to stormy, rainy days with very little warning. During the Fall and Winter season the weather is a lot more bearable and the cooler weather dries out the landscaping making it easy to build a deck on the yard without causing any significant damage to your landscaping so that when Spring rolls around your yard will bounce back greener and vibrant. Get ahead of the crowd with your deck construction. 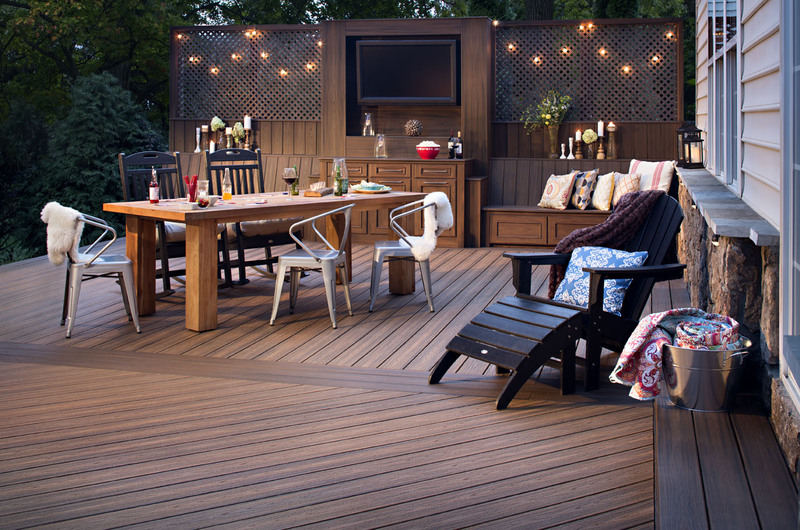 Beat the Spring rush by beginning your deck construction early so that by the time Spring arrives you will be enjoying your new deck with out having to worry about how to host Summer gatherings with no space outside. What a way to kick off the Spring, creating your dream atmosphere with accessories and colors. Take advantage of the predictable weather. Weather during the Fall season is a lot more predictable than weather during the Spring and Summer season. There are a lot less weather issues like thunderstorms that could cause a delay in construction which makes it easier for the construction crew to get the job done within a short amount of time. In the Spring and Summer months contractors are busy, and not able to be flexible with scheduling, but in the Fall, things slow down which allows contractors to be able to accommodate your scheduling needs. These are just a few reasons why building in he Fall has benefits. With frost coming, Fall is a great time to start your deck project if you need to dig. Deck building doesn’t stop cause the snowflakes are falling. With Spring, the flowers bloom and the decks blossom after a cold winter! last forever and craftsmanship on this area of your home needs to be of highest quality. joists and joist connections, stairs, deck boards, handrail assemblies and guards and miscellaneous. do is call us for a no charge consultation. efforts centered on deck safety each year discussing importance of deck safety. and help you solve potential issues. Like us on Facebook to access Deck Safety check lists that will be posted throughout this month. encompasses everything that home and family means to you. But is that home that means so much to you just not functioning or fitting your current lifestyle? look more and more like an attractive option every day. precious memories fit your needs, wants and desires. pay off when it comes to your return on investment. improving energy efficiency, security and the general comfort of your outdoor living space. The benefits to exterior renovations are limitless and all it takes to get started is a vision. Switching to low maintenance exterior products, such as composite material, can save hours of maintenance time. as well as make the most of your budget to successfully beautify your exterior parts. 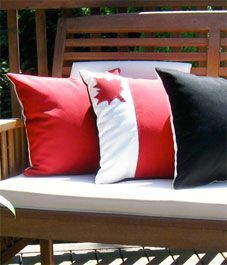 The finer details – it may seem like working backwards; picking out your accessories for your outdoor living space before you even start planning your deck however, accessories are a key fundamental to add character and create a custom design and you will want to plan the larger details to fit the smaller ones. The outdoor living space is now becoming an extension of the home and as such they require accessories to make them as livable as any indoor room. Your deck is your living room for summer and with hundreds of possible combinations from the arch of your pergola to the color of your throw pillows, each aspect of your exterior design should reflect or complement the architecture of your home and the interior design. Accessories for the exterior of your home can range from lighting to furniture to outdoor kitchens, custom outdoor spas and everything in between. Spending some of your budget on the finer details may seem like you are splurging just a little bit but put that feeling aside and reap the benefits of what the attention to details will reap you in the future. What is really becoming attractive today is ‘outdoor rooms’ or outdoor living spaces where families and friends gather outside to enjoy the peace and serenity of nature. More homeowners are adding decks, patios and outdoor kitchens to their home’s appeal. These outdoor areas are viewed as added space and value to any home where you can spend time entertaining, relaxing, living in the backyard – turf and grass are being replaced with a functional space. If you are looking to enhance your curb appeal, nothing packs a bigger punch than revamping your architectural design. Since it’s the first thing visitors see, it makes or breaks your home’s first impression — it can easily become the neighborhood star. The exterior often reflects the overall style of the house and the family that lives there, so it sets the pace for the rest of your space. In the end, whether you have stone, wood, brick, steel or vinyl siding, make sure your materials, paint colors and overall design represent what you like and who you are. You might be thinking, “Where do I start when deciding on what accessories to incorporate in my plan?” Well the first step is think about the interior of your home – what features of it do you want to bring outside? Might be lighting or maybe accent colors – always remember styles and color can vary depending on your personal style or preference. Second, research and research a little bit more to understand what is out there and available to you. Third, consult with a professional, like us, as we have the expert knowledge and insight into industry trends to bring a wealth of options to the table. We hope this provides some inspiration for gearing towards building that dream space and get you outdoors to enjoy the best of our summer. Mould is the common term used to describe a growth on the surface of organic matter, caused by fungi, especially in the presence of dampness. Mould is mother nature’s way of recycling organic matter. Every cubic foot of air has thousands of mould spores floating within it. Every surface – natural or manmade, inside or out – has thousands more spores that have settled upon it. A fungus (pl. fungi) may be any of a large number of simple microorganisms that do not need energy from light for growth. The fungi bear microscopic spores that are produced in enormous quantities, are always present in the air, and spread via air currents. They are often water repellent and are resistant to desiccation (drying out). “Mould” is often used interchangeably with the word mildew. These are the generic terms that describe a variety of microorganisms, including fungi, algae, rusts, yeasts, and bacteria. Under a microscope, mould has an octopus-like structure. Its legs attach to a surface in a web-like manner. Once a mould has successfully colonized, it turns a dark color and releases thousands of new spores. Moulds need three things to grow: food, water, and temperate weather. When the spores are in favourable environment, they will germinate. What constitutes a favourable environment is different for each species. Since the spores settle out of the air, they will be more prevalent on horizontal surfaces and are generally not found below overhangs, under porches or patios, or on the undersides of decks, even in damp areas. The colonies do not migrate, like a rot, but rather establish colonies and release more spores. The reason we recommend regularly sweeping the deck is the colonies are typically invisible; they only change color after they have released spores and died. Sweeping the deck removes the food source (pollen, dirt) and removes any dormant spores as well. After landing on a host material, a spore must obtain sufficient moisture to find enough food. Without moisture, the spores will lie dormant until favourable conditions occur. There are many common food sources, such as dust, pollen, and other pollutants. Water is essential for the growth of mould. Greater than 60% humidity, steady dampness, and temperatures between 5 and 35 degrees C, are the factors most conducive to growth. It will stay dormant if the conditions are too dry or too cold, or if there are insufficient food sources. It is important that any cleaning procedure fully remove the web-like “legs” of the colonies, penetrate the water-repellent outer surface, and remove the food source. The ideal cleaner is a steam-power sprayer, although normal power washers or combinations of bleach, water, and laundry detergent are also effective. In all cases, use the correct protective equipment such as safety glasses, dust-mask and gloves. Since mould will die at temperatures above 45 degrees C, we have had great success with a steam-power sprayer removing the mould. If staining is still present, follow with a sodium percarbonate product (OxiDeck) powder sprinkled directly on the stains, left damp for 6+ hours, and rinsed to help remove the stains. Bleach, laundry soap and water can also be scrubbed onto the mould to help with the removal of the mould. 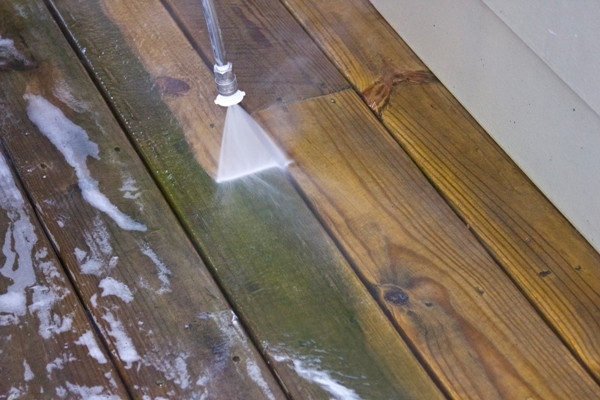 learn more about deck cleaning. -Correct Building Products also recommends No More Mildew from National Allergy Supply as a spray-on preventive measure. Contact the deck experts to learn more! The following is a brief description of the deck building process. We have also written an article titled “Design Considerations” that we encourage you to read if you’re seriously considering building a deck. Before considering any deck building project, you should determine what your budget is, make sure there are no zoning conflicts, and check with your Home Owners Association so you know their requirements. The first step in the deck building process is to set a time to meet at the jobsite, preferably when both decision-makers are home. Although decks may look quite simple, no two decks are alike, materials vary considerably, every jobsite is different – thus we don’t give “general bids” over the phone without first seeing the property. A typical first meeting will take 1 ½ to 2 hours. Larger jobs may take more time. The goal during the first meeting is to find out the scope of the project, including size, how the deck will be used, what materials you’re interested in, and do you want enhancements like lighting, grilling stations, fire pits, pergolas, etc. With simple projects, we are able to give immediate cost to construct. For larger projects, we’ll schedule a second meeting and provide you with a “footprint” drawing of the proposed deck, along with the estimate, samples, and other materials. There is no fee for the estimate to this point. If additional designs are desired, including 3D drawings, we enter into a retainer agreement for these services. After a contract has been signed, we then acquire a building permit. Permitting consists of two parts. First we draw a set of plans so the building department can verify the design and materials. The second part of the permitting process requires acceptance from the zoning department. Most projects require permits. It is the responsibility of the contractor, not the homeowner, to acquire the permit. This also places the liability on the builder and not the homeowner. As the permit is being acquired, we also order materials so they can be staged and ready for delivery. During this period we often like to bring the crew leader to your home to see the project, meet homeowners, etc. It typically takes at least two weeks or more to look at a job, draft a contract, draft plans, acquire the building permit, and acquire materials. Project durations vary depending on factors like deck size, height, access, weather, efficiency of the builder, number and type of accessories, and type of materials being used. 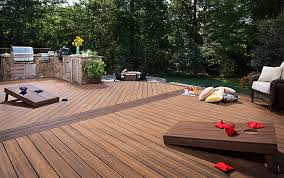 Spring and the early summer months is the peak deck building season since most people want projects completed prior to the warm summer months so they can enjoy their newly built decks. Make sure you plan ahead if you want your deck completed early in the year so you don’t end up months out on a deck builder’s schedule. We build decks year around. Although bad weather can impact a job, we don’t usually lose many working days to cold, snow, or rain. Wind is usually our biggest weather obstacle and is more prominent in the spring. The advantages of building a deck in the fall and winter months are that there aren’t usually material delays and lumber prices are usually less (lumber is a commodity, thus supply and demand dictate price). To schedule an estimate, click here. Building Codes: Regulations detailing accepted materials and building methods, usually adopted by city, county, or provincial building departments. Composite Decking: Decking that is manufactured from a combination of wood fiber and plastic, creating a “low-maintenance” product. Cleaning is typically the only maintenance required. Warranties vary from ten years to limited lifetime warranties. Warranties cover manufacturing defects such as splitting, rotting, or delaminating. Dead Load: The weight of the structure itself, which includes decking, support structure, railings, and other permanent features (grilling stations, fire pits, hot tubs, etc). 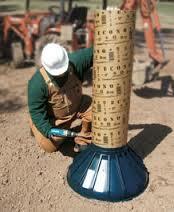 Flashing: Strips of metal or waterproof material used to make joints waterproof. Flashing and beams should always be flashed. Footing: Also referred to as a “pier”. This is the foundation of the deck, consisting of concrete on which the deck-supporting posts will rest. Grade: A designation given to lumber indicating the amount of flaws and knots typically found in the wood. 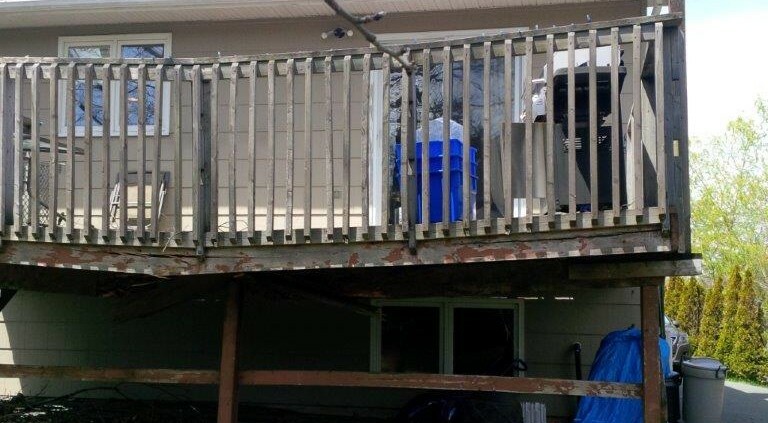 Guardrail: A protective railing required when decks are 24” or more off the ground. Residential guardrails must have a minimum height of 36”. Linear Feet: The total length of a building material. For example, if you had two decks boards that were each twelve feet in length, you would have twenty-four lineal feet. Live Load: Part of the total load on structural members that is not a permanent part of the structure. Live loads may be variable, as in the case of loads contributed by occupancy (people), wind, and snow loads. Low-Voltage Lighting: A 12-volt lighting system that uses a transformer to reduce the current from 110 volts. Low voltage lights, also available with LED bulbs, are routinely installed on deck posts, step risers, and in landscapes. Patio Cover: A solid roof typically installed over a deck or patio, providing protection from the weather. Pergola: A shade structure that is typically installed over a deck or patio. Pergolas are usually made of wood. Post Base: A small piece of metal hardware connecting the bottom of a post to the concrete footer. Also called a Saddle Bracket. Post Cap: A small piece of metal hardware connecting the top of a post to a beam/girder. Pressure Treated Wood: Wood subjected to a high pressure treatment of chemicals (ACQ Alkaline Copper Quaternary) to limit rot and decay. PVC Decking: Manufactured decking that is made of PVC (Poly Vinyl Chloride). Riser: The vertical piece between two stair treads. Square Feet: Computed by multiplying the width x length. 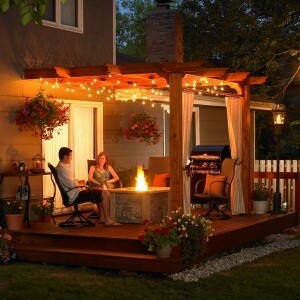 For instance, a deck that measures 10’ x 12’ is 120 square feet in size. Wind Load: The lateral pressure on a structure in pounds per square foot caused by the wind.